Automatic build process, what is it all about ? Installing a maven build process will bring various benefits for your daily development. But what are these benefits and what are they good for ? Static code analysis will help you to find potential problems in your code. Bugs might be identified and breaking code conventions can be detected early. Having automatically running tests, created api documentation and code analysis tools we have to deal with a lot of informations these tools providing us. So we would like to have a single point of entry to see the result of all the automatically running tools. The big advantage of having an automatic build process is the ability to do continuous integration. Having a continuous integration server like hudson your are able to run a complete build including tests, code analysis etc automatically on a separate machine. Whenever a developer is checking in some code, a complete build is started on the continuous integration server and feedback about that build is published immediately. So the most recent status of the project is visible at any time. We have two different source folders, one for the productive code and one for the tests only. The pom.xml file contains all the maven configurations which are necessary to meet our goals defined in the last section. To include the automatically execution of your jasmine tests the jasmine-maven-plugin is provided. Here you can find a JUnit like xml (TEST-jasmine.xml) file with the testresults for further processing through other tools like a CI server. Additionally there are two HTML test runners generated: one for test-driving locally in your browser (SpecRunner.html), and one to run as part of the build (ManualSpecRunner.html). Opening the latter one into your favorite browser will execute all the tests right away inside a real browser. With the help of jsdoc you can easily create your own separated documentation about your code quite similar to javadoc. To integrate jsdoc and jslint into the build process the maven-jstools-plugin is used. This plugin has to be configured inside your reporting section of your pom file. After that jslint and jsdoc is executed and a report is generated containing the results. 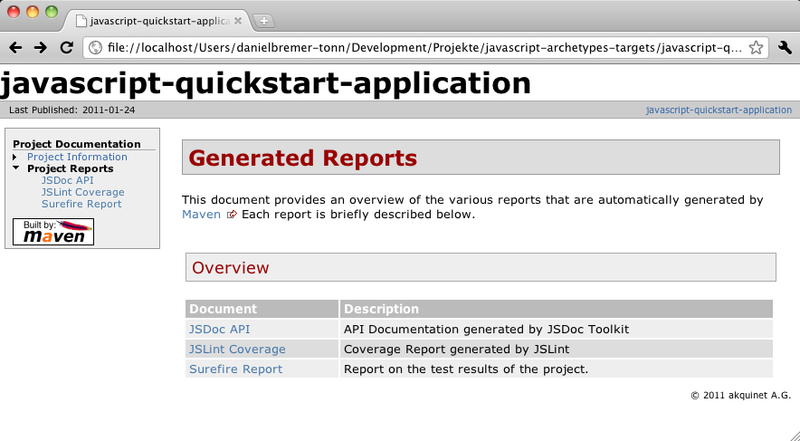 Here you have access to the generated reports of jslint and jsdoc. The jqueryplugin archetype creates a simple jquery plugin implementation which is a good starting point for your very own jquery plugins. The skeleton code obeys the rules of developing good jquery plugins. 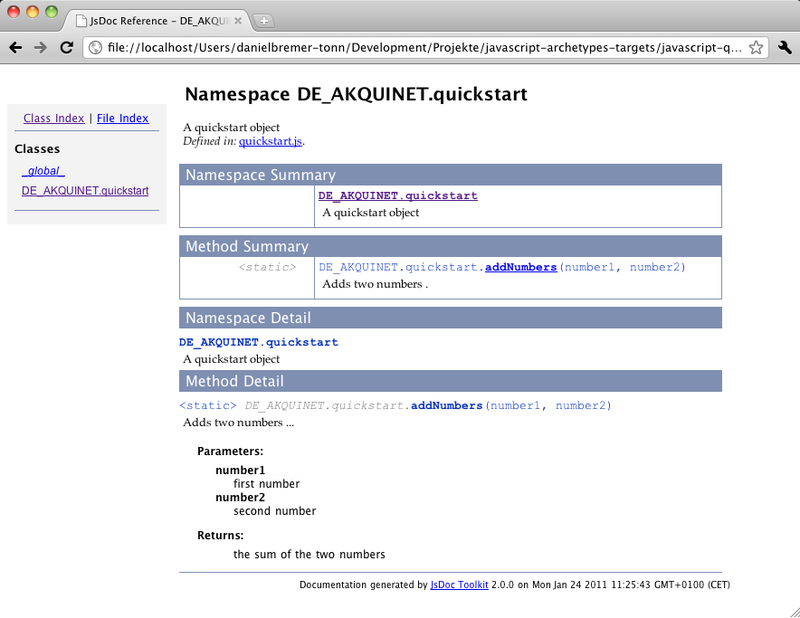 For further information check the jquery plugin authoring guide. This example jQuery plugin is simply modifying the DOM by adding some “hello world” message to it. Additionally you will find a jasmine testcase for this plugin. Furthermore there is a fully configured build process which is running the jasmine test, jslint, jsdoc and compressions. < Reusing Android components with Rindirect. Thank you for this! It’s one of the best write-ups I’ve seen on how to do a build for the front end. And the Archetypes are a generous gift! Question… are there many situations when you would want to ONLY build the front-end, or would you usually run this at the same time that you build the back end? Also, where or how would I set my preferences for how JSlint or any of the other plugins function? The “reportSets” tag has to be in the “configuration” tag. Thank you!! Great post.. I am working on Angular JS project and was in need of similar instructions. I’m a little confused with surefire plugin at the end of artifact. It is not explained, and from what I found on internet, it’s for Java tests. Has it some purpose or it shouldn’t be there? I want to learn how to create a similar maven archetype for my enterprise. Could you please share / link to a good learning resource to create an archetype from an existing project?